Some 88 years ago, when aviation was in its infancy, Bessie Coleman became the first African American airplane pilot and the first American of any race or gender granted an international pilot license. In fact, Coleman and 14 other women received international pilot licenses before the famed aviatrix Amelia Earhart. 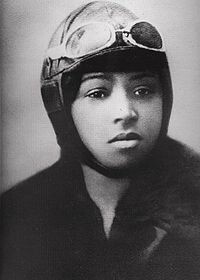 On June 21, 1921, Coleman not only became the first African American woman to earn an international aviation license from the Federation Aeronautique Internationale, but the first person of African descent in the world to earn such a license. Earhart did not receive her license from the Federation Aeronautique International until almost two years later, on May 15, 1923. Popularly known as "Queen Bess," Coleman came from meager means. She was born Elizabeth Coleman on Jan. 26, 1892 in Atlanta, Texas. She was the 10th of 13 children born to sharecroppers George, who was part Cherokee, and Susan Coleman. Coleman's early education was typical of the time. She walked four miles each day to her all-black, one-room school which suffered from shortages of materials such as chalk and pencils. Nevertheless, she was a good student that loved to read and excelled in math; she completed all eight grades though each year was interrupted by the cotton harvest. Things changed dramatically for Coleman in 1901 when her father left the family and returned to Indian Territory (Oklahoma) to escape the racial barriers of Texas and find better opportunity. When she turned 18, Coleman took all her savings and enrolled at Oklahoma Colored Agricultural and Normal University, now Langston University. She completed only one term before she ran out of money and had to go home. Knowing there was no future for her in Texas, she went to live with two of her brothers in Chicago where she worked at the White Sox Barber Shop as a manicurist. There she was regaled by the stories of pilots returning from World War I and became fascinated by the possibility of becoming a pilot herself. Her brother often teased her saying French women were better than African American women because French women were pilots already. It was at the barber shop where she met such influential blacks as Robert S. Abbott, founder and publisher of the Chicago Defender, and Jesse Binga, a prominent real estate promoter. Binga and the Defender provided Coleman with financial backing while capitalizing on her flamboyant personality and beauty to promote the newspaper and her cause. When she could neither gain admission to any American flight school because she was black and a woman, nor persuade any black aviator to train her, Abbot encouraged Coleman to study abroad. She studied French at the Berlitz in Chicago before traveling to Paris in November 1920. There she learned to fly a Nieuport Type 82 biplane, with "a steering system that consisted of a vertical stick the thickness of a baseball bat in front of the pilot and a rudder bar under the pilot's feet." Six months later, she received her international pilot license but was determined to polish her skills. So she spent the next two months taking lessons from a French ace pilot near Paris before returning to New York in September 1921. She became an instant media sensation and a highly popular draw for the next five years. Invited to important events and often interviewed by newspapers, she was admired by both blacks and whites. With commercial flight more than a decade away, Coleman soon realized that in order to make a living as a civilian pilot, she would need to become a barnstorming stunt flier and perform for paying audiences. However, success in this highly competitive arena required advanced training and a more extensive repertoire that no American instructor was willing to teach. So in February 1922, Coleman returned to Europe where she spent the next two months in France completing an advanced course in aviation. She then left for the Netherlands to meet with Anthony Fokker, one of the world's most distinguished aircraft designers. Coleman also traveled to Germany where she visited the Fokker Corp. and received additional training from one of the company's chief pilots. Afterwards, she returned to the U.S. with the confidence and enthusiasm needed to launch her career in exhibition flying. Coleman primarily flew Curtiss JN-4 "Jenny" biplanes and army surplus aircraft left over from the war. In Los Angeles, she broke a leg and three ribs when her plane stalled and crashed on Feb. 22, 1922. She made her first appearance in an American air show on Sept. 3, 1922, at an event honoring veterans of the all-black 369th American Expeditionary Force of World War I. Held at Curtiss Field on Long Island and sponsored by Abbott and the Chicago Defender, the show billed Coleman as "the world's greatest woman flyer," and featured aerial displays by eight other American ace pilots. Six weeks later, she returned to Chicago to deliver a stunning demonstration of daredevil maneuvers -- including figure eights, loops and near-ground dips -- to a large and enthusiastic crowd at the Checkerboard Airdome (now Midway Airport). The press often criticized Coleman for her opportunistic nature and flamboyant style but she also quickly gained a reputation as a skilled and daring pilot that would stop at nothing to complete a difficult stunt. Despite her public persona, Coleman showed her true colors when she walked off the set after accepting a role in a feature film, "Shadow and Sunshine," that degraded blacks. She had gladly accepted the role hoping it would help advance her career and provide her with money to establish her own flying school. But when she learned the first scene required her to wear tattered clothes, with a walking stick and a pack on her back, she refused to proceed. "Clearly, her walking off the movie set was a statement of principle," wrote Doris Rich. "Opportunist though she was about her career, she was not an opportunist about race. She had no intention of perpetuating the derogatory image most whites had of most blacks." Coleman would not live long enough to fulfill her greatest dream -- establishing a school for young black aviators -- but her pioneering achievements serve as an inspiration for generations of African American men and women. "I point to Bessie Coleman and say without hesitation that here is a woman, a being, who exemplifies and serves as a model to all humanity; the very definition of strength, dignity, courage, integrity and beauty," Dr. Mae C. Jemison, first black woman astronaut to fly on a space shuttle, said in Rich's 1993 book, Queen Bess: Daredevil Aviator. "It looks like a good day for flying," Jemison wrote. Lt. William J. Powell, who served in a segregated unit during WWI, and in 1929, founded the Bessie Coleman Aero Club, tirelessly promoted black aviation. He immortalized Coleman in his 1934 book, Black Wings. "Because of Bessie Coleman, we have overcome that which was worse than racial barriers. We have overcome the barriers within ourselves and dared to dream," Powell wrote. Coleman died April 30, 1926 at the age of 34 in Jacksonville, while preparing for an air show. Her mechanic/publicity agent William Wills was flying a plane recently purchased in Dallas and delivered to Jacksonville. Coleman was not wearing a seat belt because she was surveying the terrain over the cockpit for a parachute jump the next day. The plane did not pull out of a nosedive but instead accelerated into a tailspin. Coleman was thrown from the plane at 500 feet and died instantly when she hit the ground. Wills was also killed when he could not control the plane and it plummeted to the ground and burst into flames. It was later discovered that a wrench used to service the engine had slipped into the gearbox and jammed it, causing the plane to spin out of control. The African American community began immortalizing Coleman immediately after her death. However, it was not until 60 years later that other honors were forthcoming. In 1989, she was inducted into the "First Flight Society" that honors aviation pioneers. A conference room at the FAA is named after Coleman, and in 1990, Chicago Mayor Richard Daley renamed a street at O'Hare International Airport for Coleman. In 1995, she was honored with a U.S. postage stamp, and was inducted into the Women in Aviation Hall of Fame. She was inducted into the Texas Aviation Hall of Fame in 2000. In 2004, a small park on Chicago's south side was named in Coleman's honor. Coleman is the subject of Barnstormer, a musical that debuted in October 2008 at the National Alliance for Musical Theater Festival in New York.